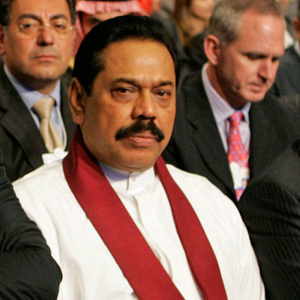 Mahinda Rajapaksa took office as President in 2005. He immediately began a relentless drive to defeat the LTTE ‘Tamil Tigers’ and end the long-standing civil war by employing a military-only solution. His brother Gotabhaya became the Secretary of Defence, and another brother, Basil, was appointed the President’s Special Advisor. During the past four years, the voice of media was severely restricted, Sri Lanka had the highest rate of ‘disappearances’, and the government was repeatedly accused of corruption, human rights violations, and even war crimes. By succeeding in ending the civil war, however, President Rajapaksa has achieved almost a ‘cult of personality’ status among the Sinhalese majority in Sri Lanka. General Fonseka is the only individual in Sri Lanka who has a chance of beating Mahinda Rajapaksa in the January 2010 presidential elections. As the Army Commander during the last few years, General Fonseka is considered a hero for his role in leading the country to victory over the LTTE ‘Tamil Tiger’ separatists. Since the final phase of the civil war began, President Rajapakse has used one criterion in deciding who are Sri Lanka ‘s ‘true’ friends and who are not. Nations that consistently supported his military-only solution to the civil war are ‘true’ friends; nations that called for a negotiated settlement with Tamil rebels are not. This delineation has resulted in a new anti-western sentiment in Sri Lanka (heightened by rekindled anti-colonial resentment). As a result, external voices, including those of Britain, the United States and the European Union, which express concern about human rights, media control, civil rights and war crimes have greatly reduced influence. President Rajapaksa has regular praise for Sri Lanka’s new friends, most notably, China, Iran, Libya, Pakistan, Saudi Arabia, Myanmar, and Russia.